Gamers mainly have three ways to enjoy games: Consoles, computers, and mobile devices. Game consoles such as the PlayStation and Xbox are machines that only run their dedicated software. It is not likely one can use gaming consoles for any productivity work, unless they were to do some major modding. Computers, however, are much useful in a sense they can be used them for both recreational and productivity activities. On the other hand, a mobile device such as cell phone is even more portable and it too can be used in gaming and non-gaming use cases. It seems one should at least have a computer and a phone. Ideally, both the computer and the phone are powerful enough to run some games, so the user can play games anywhere. However, if you are a poor student like me, owning a high-end gaming computer and a nice gaming phone is a luxury. It would be nice if one device can be both a phone and a computer. Some endeavors from Razer and the Project Linda do exactly this by combining a laptop-like case with their phone. I believe the price for both of the phone and the case combined is less than buying a gaming laptop and a flagship phone. Thus, it seems there is no point for gaming laptops anymore, since it is foreseeable the phone will cannibalize this market. However, the opposite transformation is not possible. If you think a phone is not powerful enough for games, then building a gaming desktop computer would still be a good choice. At least the fun of building your own system should not be taken away, right? For today’s review unit, the SilverStone Redline RL07 is ready for you if you want to build a gaming desktop. Let us read on and find out if it is a good choice! Today’s review unit was shipped from Chino, California, USA to us here in Calgary, Alberta, Canada. Chino is the location of SilverStone’s office in North America. Although you may see a beat up corner on the parcel, there are actually no signs of unacceptable damage on the shipping box itself that may make you nervous about the safety of the case. After more than a thousand miles of transportation, I can take one hit on the corner -- well done, UPS. Usually, a good retail package design can draw people’s attention and make the product itself stand out among hundreds of other products on the shelf. However, the realm of computer cases is different. Most of the time, the dealer will either directly put sample cases on the shelf, or just demonstrate some fully built computers using those chassis. Therefore, it is mostly unnecessary to have a fancy retail package for a computer tower. At least for me, I would not buy a computer case just because it looks great on the box. 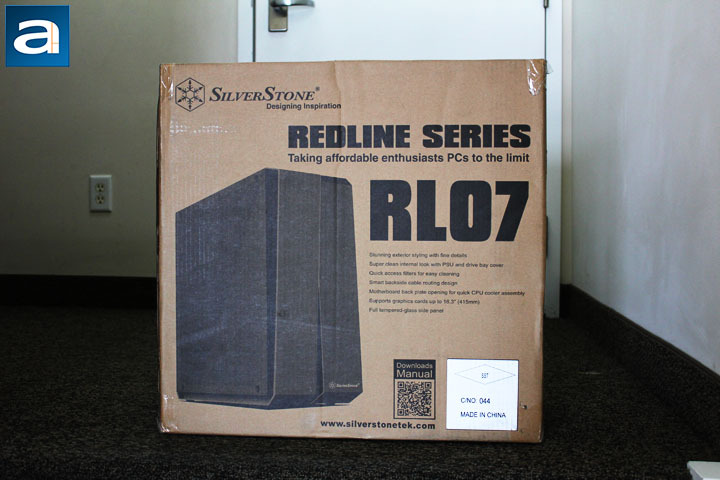 The retail package of SilverStone Redline RL07 is simply a brown cardboard box. It shows a nice black-and-white photo of the product. At the front side, the company’s name is present on top of the box. 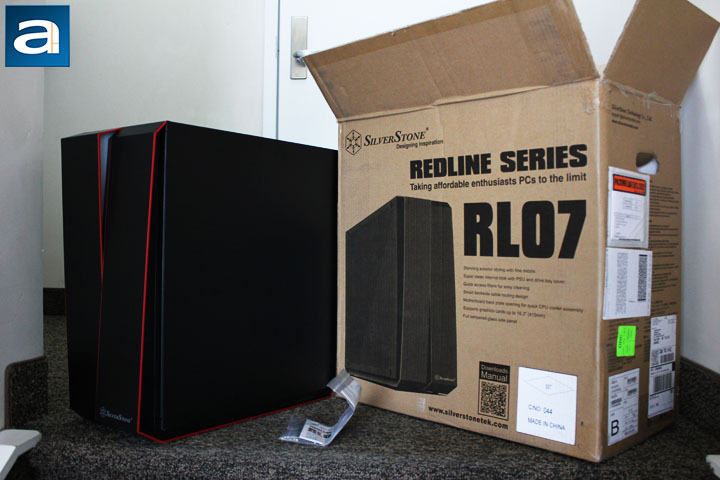 The model name “REDLINE SERIES RL07 " is located below the company logo, as you can see from the above picture. The clean look of the retail package may suggest the product itself will be compact and clean as well. Upon opening the box, you will see the case is wrapped inside a big plastic bag. The plastic bag is strong enough to prevent the paint from getting scratches. You can keep the plastic bag, since it can be reused if you want to take your computer to other places. An extra layer of protection has always been a good thing. Since the whole chassis is supported by two pieces of foam brackets around the case, there is no direct contact from the shipping package and therefore no damage is found on the case. As a computer case with sleek design, there are not a lot of things in the box other than the computer case and a user’s manual. The bag that contains all the hardware is located somewhere inside the case. We just need to take the tempered glass panel off and see.